Leopold H. Harris opened his first haberdashery in the Plaza area of Los Angeles in 1856 before partnering with Herman W. Frank. 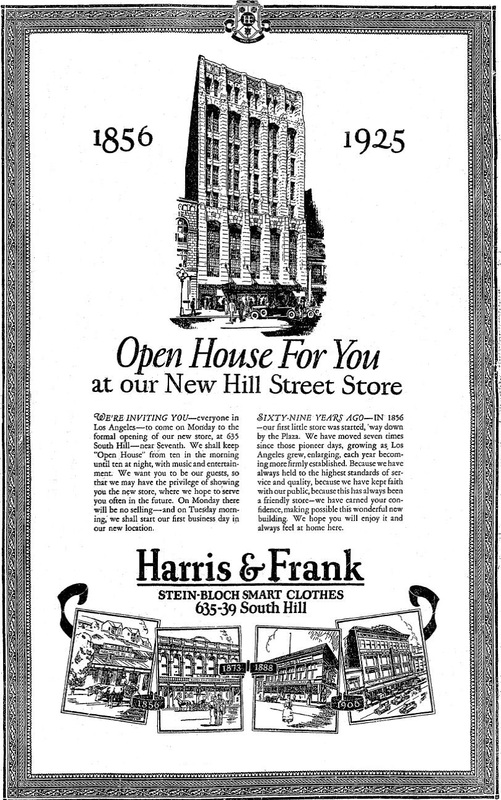 In 1925 Harris & Frank moved into its handsome new building at 635-639 S. Hill St. In 1926 the pioneer retailer was to an eastern syndicate. 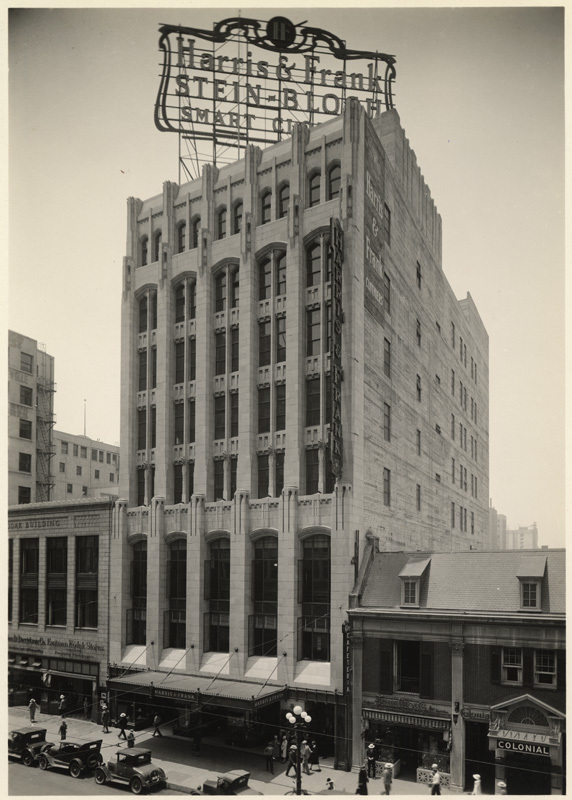 The 8-story modern structure designed by Curlett & Beelman was the fifth home of the pioneer clothing retailer, which had been “growing as Los Angeles grew.” They celebrated the opening with a reception on November 8, 1925, featuring the Harold Roberts orchestra. H & F specialized in moderately-priced national-brand men’s apparel like Stein-Bloch. By 1926 they also had a women’s department. Herman Frank arrived in Los Angeles from Walla Walla, Washington in 1887. He had been running H&F solo since the death of Leopold Harris, who had been his father-in-law as well as his business partner, in 1910. Now he was getting ready to retire. In October 1926, local merchants W.T. 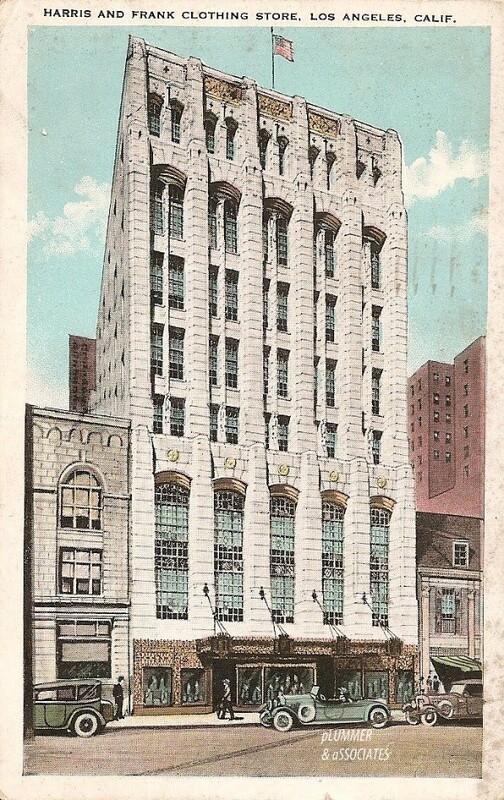 McDowell and Herman Politz negotiated a merger with Frank to take over a new “Harris & Frank Co.” The next month the newly formed company sold out to an eastern corporation. Frank retired from business in 1927 but remained active in Los Angeles civic and philanthropic circles. He returned to manage Harris & Frank in 1934, and saw the company through the dark days of Depression. He died in 1941 at age 81. Harris & Frank’s next big merger was in 1947 when it absorbed the Brook’s clothing chain. The 635 S. Hill store closed in 1950 when H&F relocated to the Brook’s former flagship store at 644 S. Broadway. Top image: Pummer & Associates.